Our face painting is loved and enjoyed by all ages. Cute, scary, funny or beautiful - painted faces bring out the creativity and imagination in all of us. Our face painters use professional hypo-allergenic face painting materials. The complexity of design will be based upon the time you request and the amount of children participating. It is estimated to paint about 12-15 children per hour. 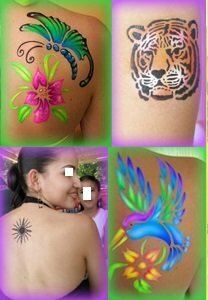 We highly recommend you request more time for half or full face design, and also adding an additional face painter. Whether a corporate event, Children’s birthday party, Family reunion, Grand opening, Company picnic, Graduation, Bar Mitzvah, Quincenera, Baby Shower, Bridal shower, Wedding, Festival, School carnival, or any other event Spring Party Rentals provides excellent entertainment! $250 up to 2hrs. Additional hours and face painters available!